Swingtrip Day 9 -Our final day! 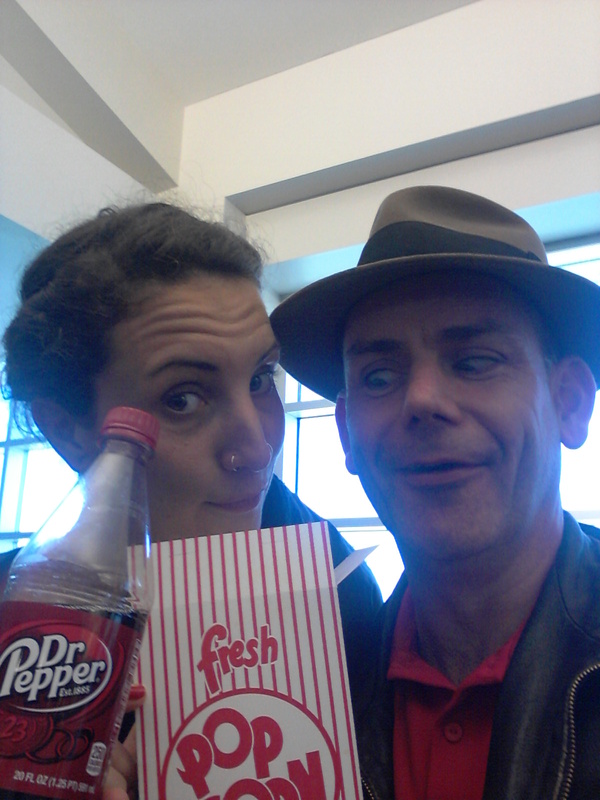 Leaving New Orleans..the end of our Swingtrip… popcorn and Dr. Pepper! 20 hours later we would be home in Italy. Day 9 – Our final day !!! Well, Day 9 was a fantastic way to finish our Swingtrip. No surprises for the ffirst thing of the morning- Breakfast! Breakfast! Breakfast! Deja Vu…. open 24 hours… great at 2am! 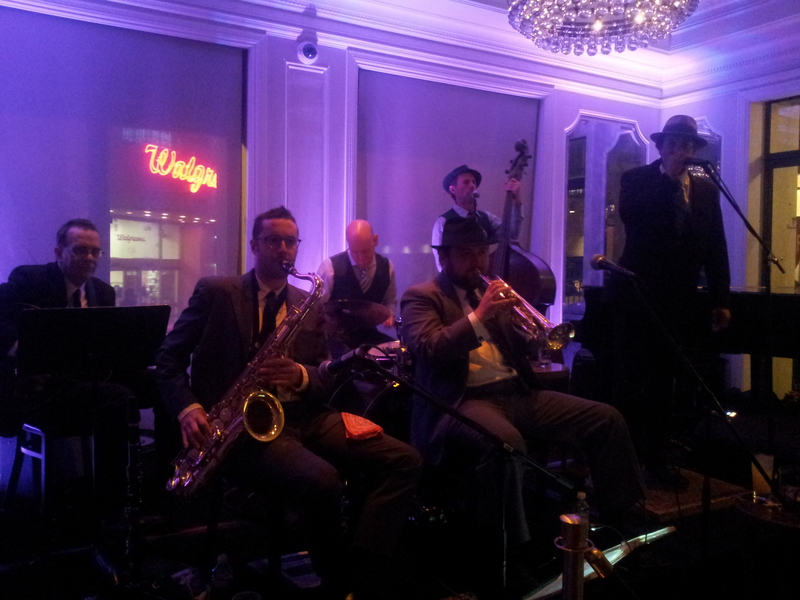 The Smoking Time Jazz Band with Chance Bushman singing and Johnny Joyce on Double Bass… at the Monteleone on Royal. 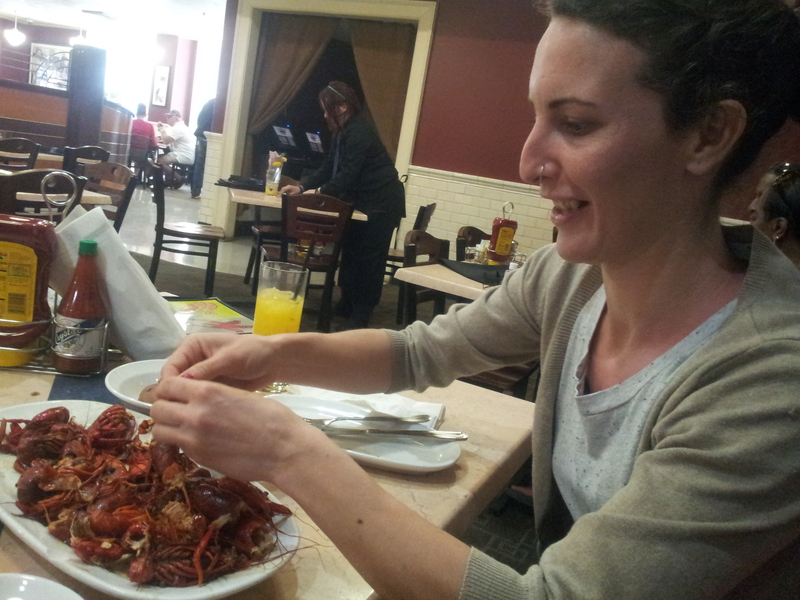 at Deanie’s seafood restaurant… Alice digging into a pound of crayfish! Chance and Cat … lindyhoppers. We were so glad to have met these guys! Here’s the video, Chance is dancing with Alice and then between singing choruses Chance passes Alice to me…. 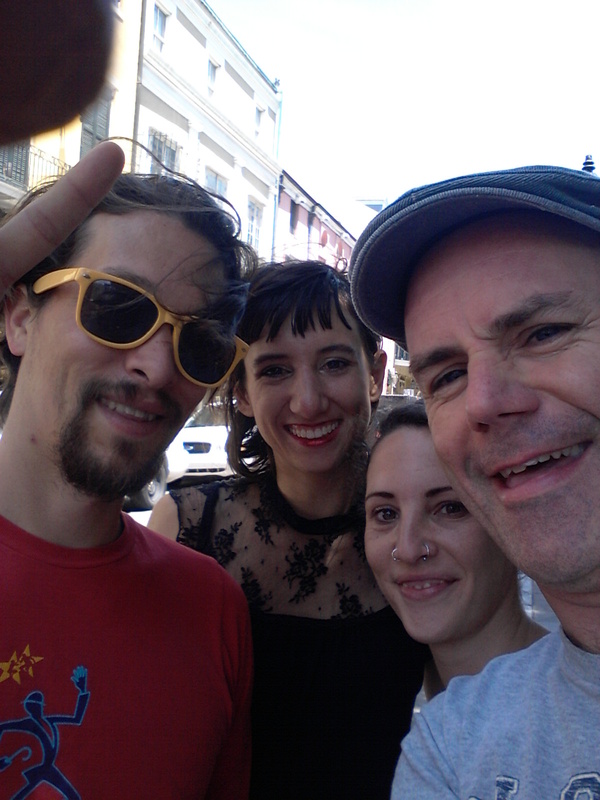 We chatted with Chance and Johnny , only to find out that Chance danced Lindy Hop in Rome in the early 2000s when maestro Eddy Ceccarelli was beginning. The two guys knew each other well. Chance spent six months in Rome . Having traveled abroad a lot Johnny Joyce and Jimbino Vegan know plenty of Italy swing musicians… including Alessandro Centolanza…. so it was great to find points of contact and to realize once again that we are all just part of one super big family in the Swing Jazz world. We had so much fun on Royal and the guys were great. They invited us to the Hotel Monteleone (also on Royal) that night where they’ve got a regular Thursday night gig. So we saluted them and continued our final day of sightseeing. Of course shopping was on the cards again. We went to Trashy Diva’s second store http://www.trashydiva.com/ and met Mia Goldsmith, the international Lindy Hop teacher, who was so welcoming and friendly. A pair of shoes and a hat later (for Alice of course) and we moved on to have lunch at Deanie’s seafood restaurant. Deanie’s is famous in New Orleans but I suspected yet again that you need to know the locals to get the best eating spots. 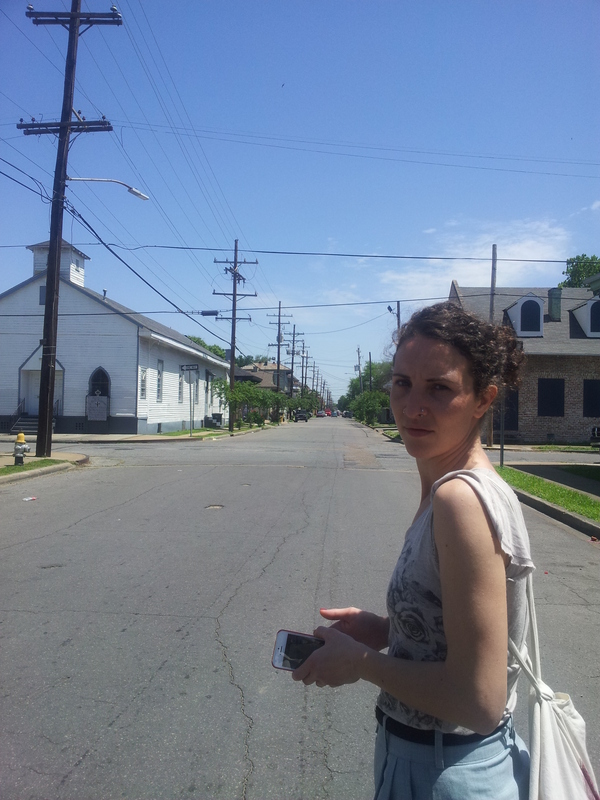 We went for a walk afterwards to Marigny, a neighborhood just east of the French Quarter to have a look. This is where The Spotted Cat and other local haunts (including Mimi’s where we had been the previous night) are currently enjoying fame after the demise musically and otherwise of Bourbon Street over the years. Frenchman Street seems full of these newer venues. Unfortunately, we would have needed minimum another night in New Orleans to have “tasted” the music and atmosphere. Back to shopping….. yes, Alice was non-stop at this point… a beautiful skirt and a dress from… hmm what was the name of that place?… We’ll find it for you! I must have bought something on this trip…oh yes !… a box of the famous Café du Monde Beignet mix to take home to Italy. These beignets are soooo good!! Yummy! 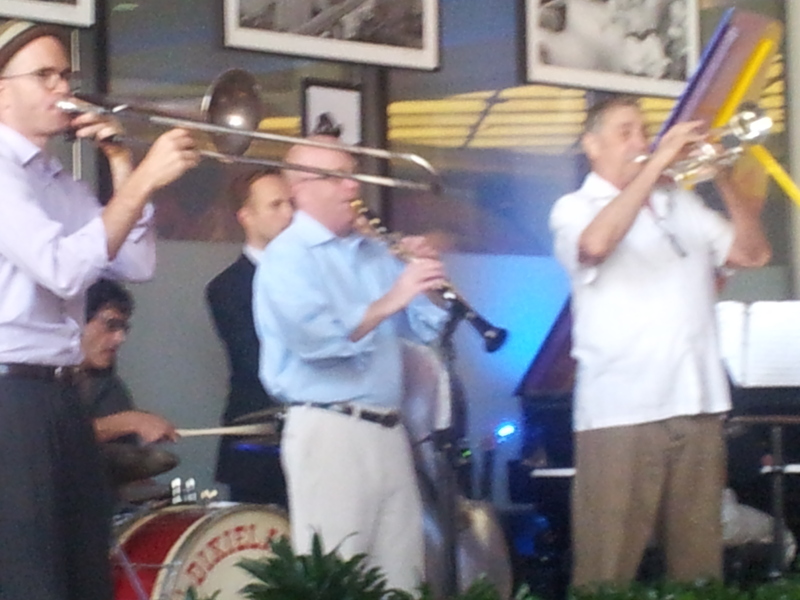 A shower and change at the hotel and we were back on Royal at the Monteleone to hear the Smoking Time Jazz Club. We weren’t late but the guys were already playing to a packed lounge. 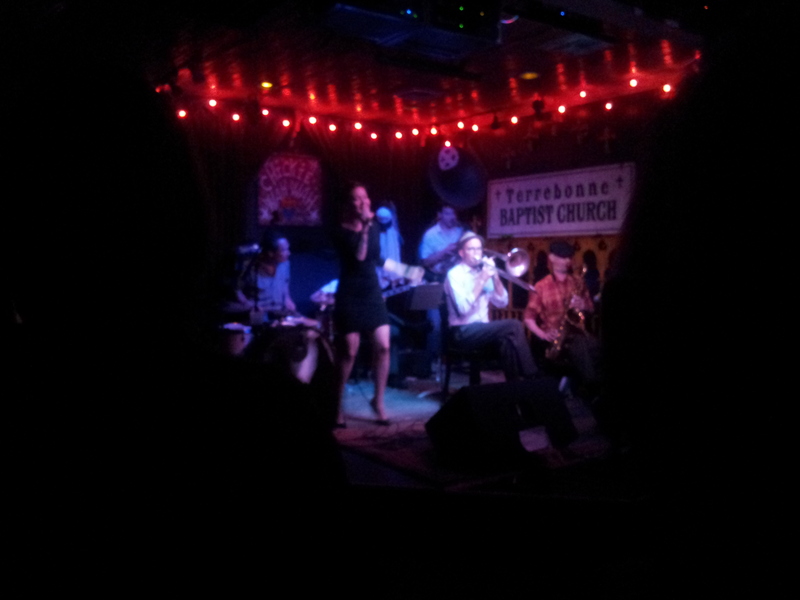 In New Orleans a band starts playing at 8.30 pm and continues until after midnight… minimum three sets. That’s a SERIOUS amount of playing. Think of the guys blowing horns! We danced. Alice tore the place up, danced a number with Chance, the frontman and showman. I was invited to sing Margie and was delighted to do so. Next day we flew home to Italy…. Thanks for reading our blog and following us on this fantastic adventure and discovery. If we can be of any help with suggestions etc, just contact us on Facebook! 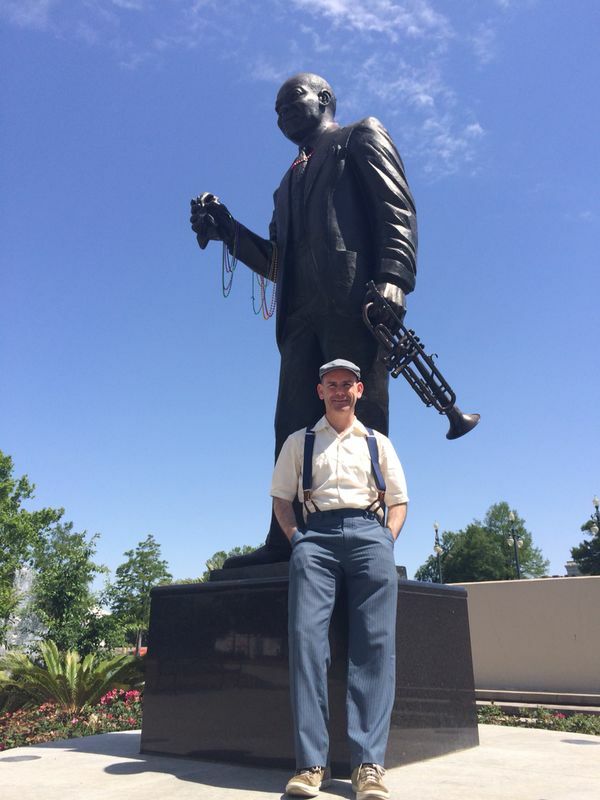 The statue to Sidney Bechet in the Louis Armstrong Park right beside the French Quarter.. some really cool info about Bechet on the plaques commemorating him. Alice in Treme in New Orleans, the oldest black neighborhood in the US and intrinsically linked to the birth and development of Jazz…. Day 8… it’s 8.30 am …. and this is New Orleans ! New Orleans Southern cooking…. 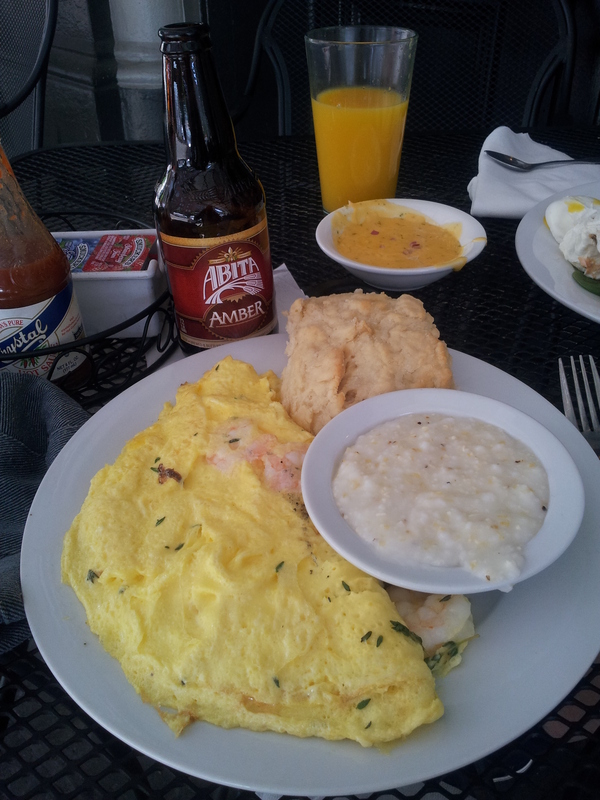 Gulf Shrimp Omelette, with Grits and Biscuit…. Alice LOVED the grits!!!! 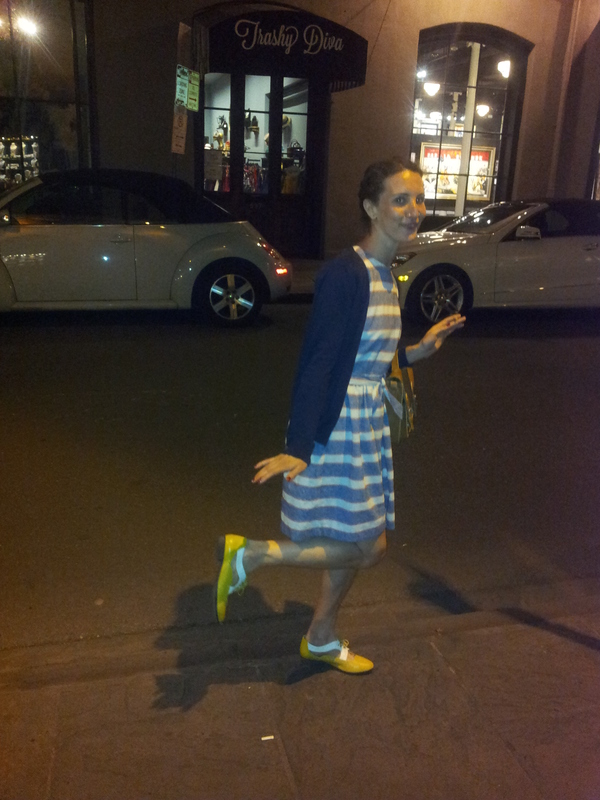 It’s late, we’re tired after a great day but Alice still has time to look beautiful…. Thanks for your continued reading of our fabulous Swingtrip to the USA. Day 7 was ALL TRAVEL. Of course we had breakfast (pancakes, scrambled eggs and toast, bacon etc.) as usual. Then a taxi to JFK airport where we boarded for Washington DC, the connecting airport for New Orleans. Unfortunately the flight was delayed for an hour and we realized we’d be getting in quite late to New Orleans. In the end we were so tired that we just decided to stay in and get up early the next morning. So no Swing or Lindy Hop on Day 7. 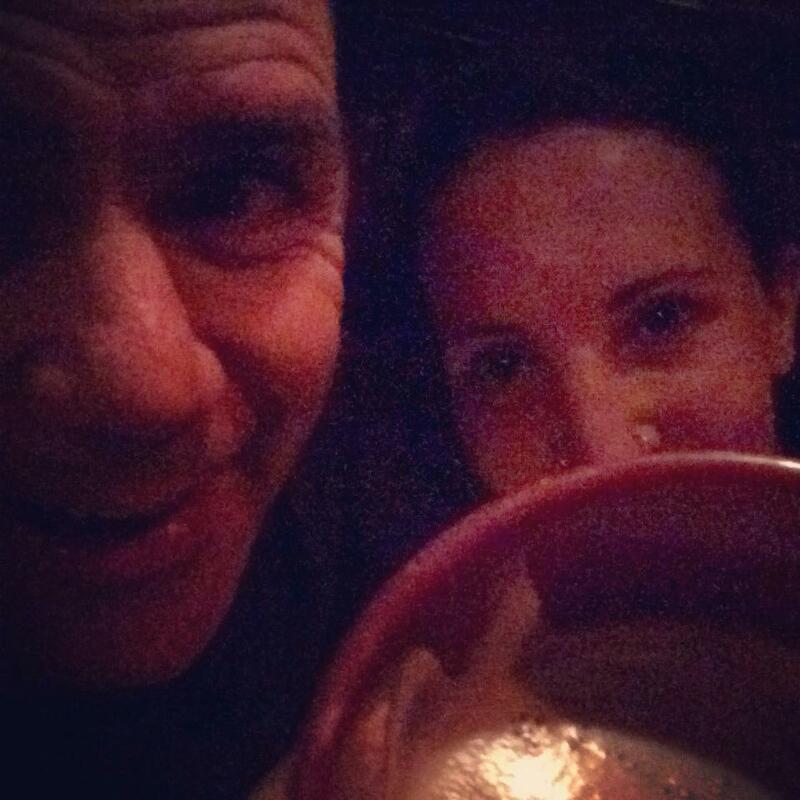 Day 8 would be different and you can read all about it below…. 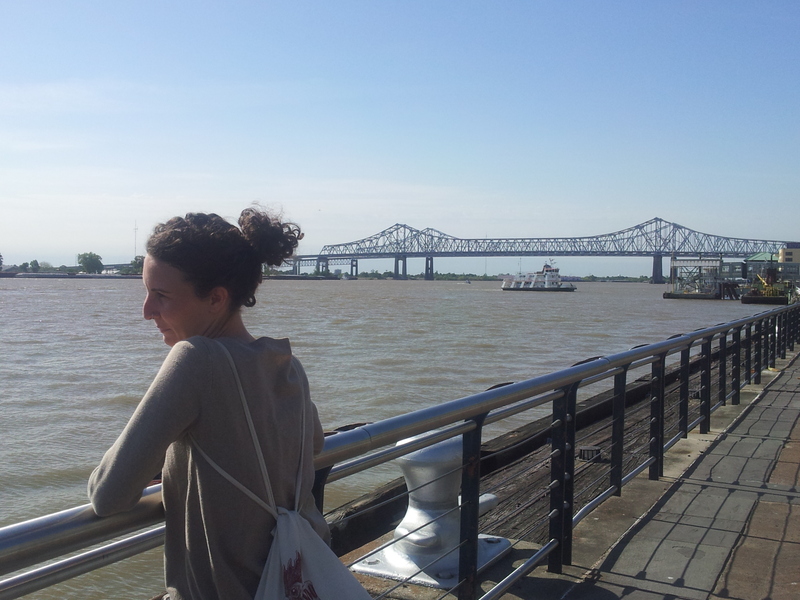 New Orleans, Charlie Halloran, dancing in the Sheraton, Trashy Diva, Po-Boys sandwiches, Meshiya Lake and Mimi’s club. Day 8 was full. We got up early and discovered that our hotel (Country Inn on Magazine Street) had a great breakfast! We left early and started sightseeing. All was quiet that morning. You would not have guessed that the Jazz festival was on that weekend. As it turns out the Jazz Festival is not in downtown New Orleans itself but located at Fair Grounds Race Course which is on Gentilly Boulevard about 5 km from the French Quarter. This is interesting as we had expected the city to be FULL of street bands that weekend and FULL of people, which it wasn’t, probably because visitors were at the Festival during the daytime. Furthermore we arrived and left mid-week, before the full festival started. One Lindyhopper and jazz aficionado we met the following night suggested that the music downtown (streets, bars, hotels) was in general better than the music he had heard that day at the festival. One person’s opinion… The other thing to note is that the festival is entitled “New Orleans Jazz and Heritage Festival” and there is a lot of non-jazz music there. This year for example Bruce Springsteen and Eric Clapton also played. 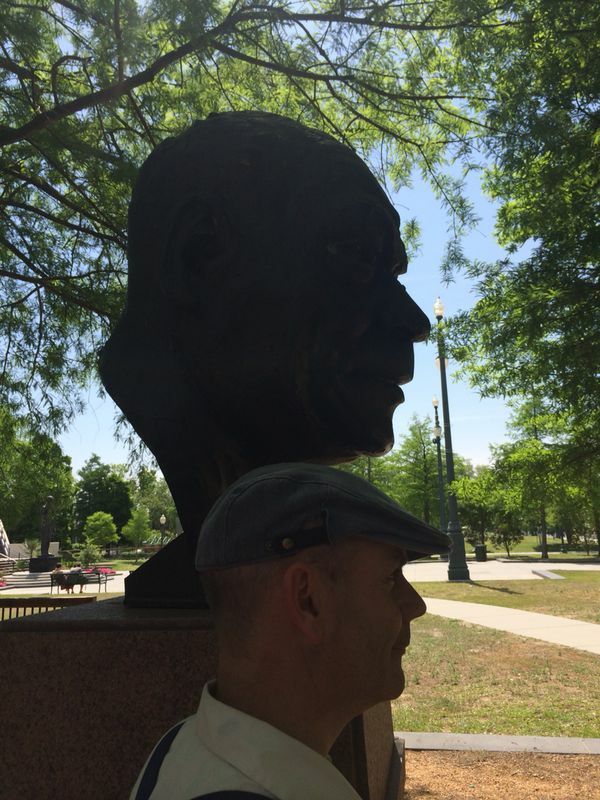 Myself and Alice decided not to go to the festival, despite a very gracious offer by our friend Charlie Halloran, as we only had two full days in New Orleans and we wanted to discover the city a little. People in New Orleans are SO FRIENDLY. It reminded me of being in Ireland. Unexpected “Good morning”s everywhere from local people just walking their dogs or going to the grocery store. People here are genuinely interested in chatting and getting to know you. It’s lovely. We went to Louis Armstrong park just north of the French Quarter. It was lovely. I particularly wanted to see Basin Street because of the famous song, which is part of every swing jazz singer’s repertoire (my own included)… but today’s Basin Street is a very busy road lacking character. 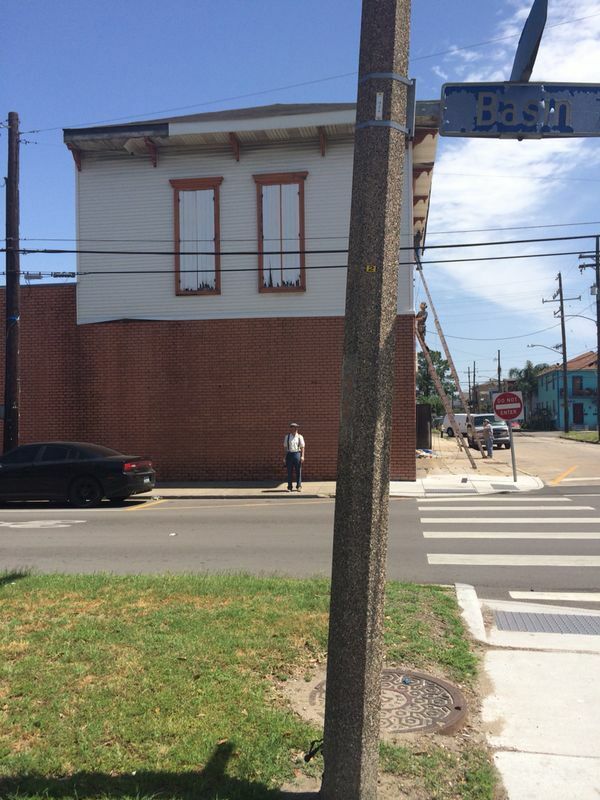 The neighbourhood around it though and north of the Louis Armstrong park is called TREME. It’s the oldest black neighbourhood in the US it seems and has serious roots with blues and jazz. Walking through the streets in Treme with its colourful houses was great. Then we stopped off at Trashy Diva http://www.trashydiva.com/about-us/ , a shop which sells shoes, dresses and accessories inspired by the 1940s and 1950s. It’s particularly interesting for Lady Lindyhoppers, although it does not sell dancing shoes per se. There are two Trashy Divas in New Orleans and dancer and international Lindy Hop teacher Mia Goldsmith also works in one of them. Mia was off so we didn’t get to see her until the following day. It was time for lunch. Alice discovered “grits and biscuit” (from my plate!) , a dish which is very common in Southern cooking. I had an Abita Amber beer and discovered over the following two days that it’s sold EVERYWHERE in New Orleans. As a beer, in my opinion it’s just okay. Then off to Canal Street to listen to our friend Charlie Halloran play trombone in the Sheraton hotel. Charlie was there with the fantastic Tim Laughlin on clarinet and the splendid Connie Jones on cornet (Connie played in Jack Teagarden’s band in the 1960s!!!!) as well as an excellent rhythm and section. I cannot describe how excellent this music was. Pure Dixieland and superb musicianship. These are musicians who LOVE Dixieland jazz and we could hear their passion. 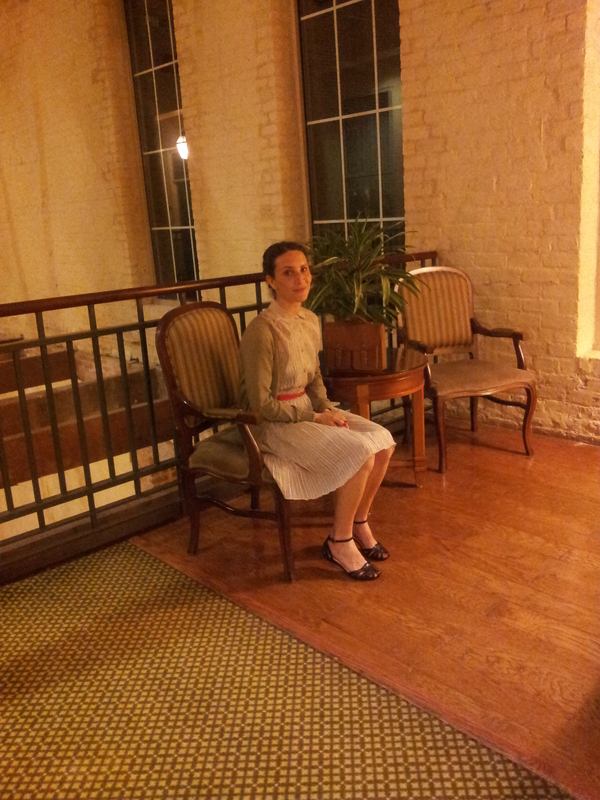 The only strange thing was the venue. I pictured them playing in a small club somewhere on a small stage… now that would have been unforgettable. We’re waiting for the videos and as soon as we get the link, we’ll upload them! We hung out with Charlie a little and then went home to prepare for the evening. Charlie was playing again that night with Meschiya Lake in a club uptown called Chickie Wah Wah. http://www.chickiewahwah.com/ It’s really well-known with locals in New Orleans. To get there we took the 47 tram going to Cemetries. Unfortunately, things don’t work on Italian time and we arrived at 9.30 (yes, 21.30!!!) to hear the band’s LAST three numbers. We were told that because it was Jazz festival week, timetables were running strictly to schedule and that usually bands play for much longer. We decided to go back downtown to check out Mimi’s club which is in the Marigny to the east of the French Quarter http://www.yelp.com/biz/mimis-in-the-marigny-new-orleans . A really nice club, you can smoke and play billiards downstairs and dance upstairs. The live music that night didn’t convince us however. Tired after a full and enjoyable day, we walked home to Magazine Street, bought some Pepperidge Farm cookies on the way (delicious! I’ve even seen them in PAM supermarkets in Rome!!) and had coffee and cookies in the hotel before turning in for the night. Day one of our two-day stopover in New Orleans completed. But this was nothing compared to the following day, Day 9 of our Swingtrip , which would be our last full day in New Orleans , the icing on the cake. Read all about it in our next post…. Busking, dancing, singing, club singing, crayfish eating, Déjà vu and of course shopping !!!! 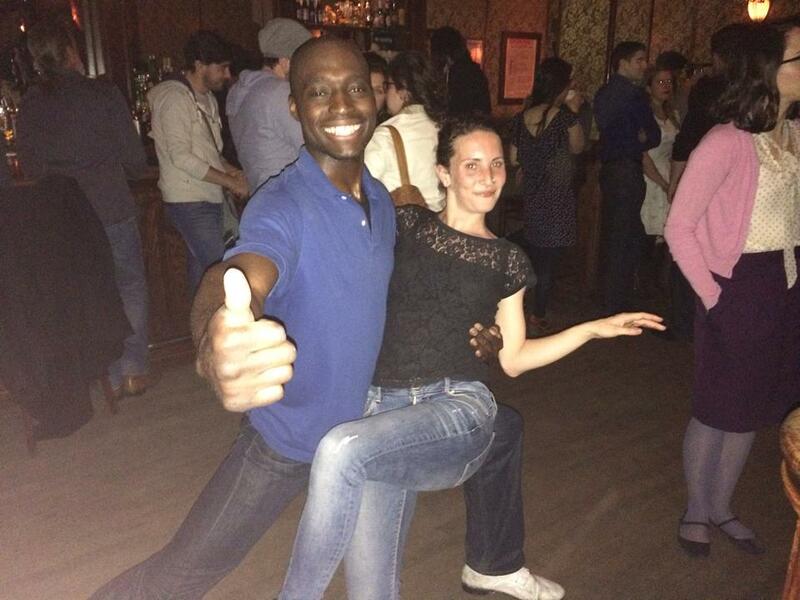 This is a really cool bar with live music and some Lindy Hop dancing on Monday nights. Unlike some of the reviews on Yelp (EVERYBODY uses the app Yelp in the States to find good places to eat, drink, go out etc.) 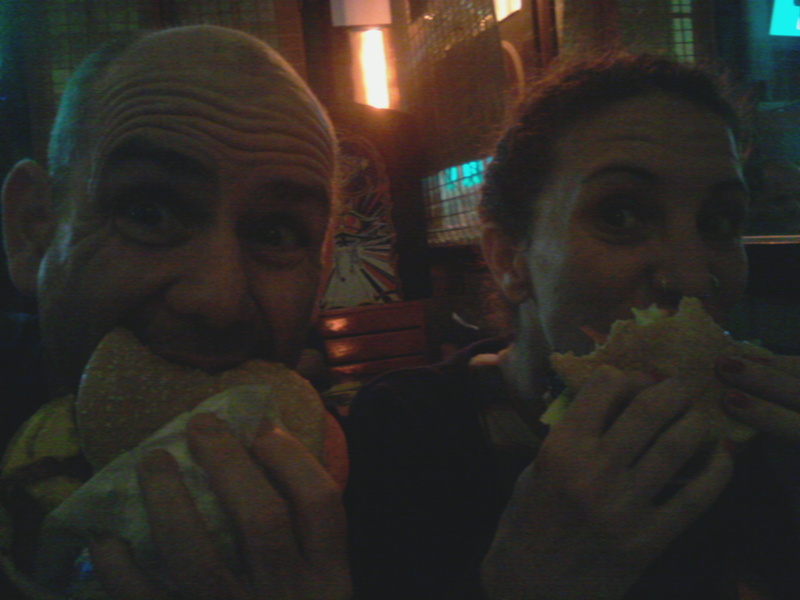 we found the staff really nice…. except for one barman who really didn’t deserve any obligatory 1 drink-1 dollar tip all night. We also met Steven Plummer who danced with Alice. He has a wonderful energy, pure Lindy spirit. Well, that was it. NYC done. Day 7 would be travelling all day long…. The only non Swing-related day in our whole trip. And then we’ll talk about NEW ORLEANS!!! We’ll get to that in our next blog posting.